On the weekend we all went up to the NY State capital, Albany, with Francine and the rest of the "6 at 6" running group to run in the Mohawk Hudson River marathon. This was to celebrate Francine's 50th birthday and was a lot of fun with a private pasta party the night before the race doubling as her birthday party. (Reminiscent of the fact that until we organized to relocate to NYC a few weeks after his own 50th, Paul had had plans to run the Great Wall of China marathon which was held the week after his birthday). 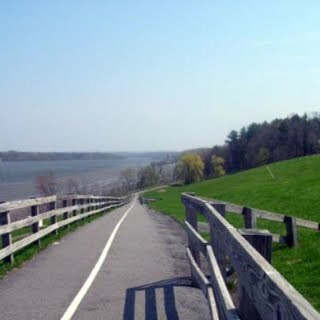 Mohawk is a point to point course that starts out in the town of Schenectady and runs into the finish line by the river in downtown Albany. 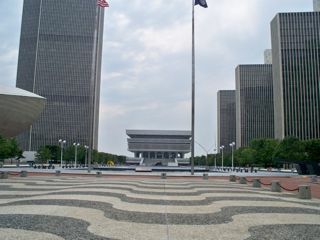 Albany is about 150 km north of NYC. Most of the way the course is is on the Mohawk Hudson Bike Hike Trail, which runs beside the Schenectady and Hudson rivers, and was very scenic this time of year with all the "fall colors". Paul had trained through the summer following the NYRR 'first timers and casual marathoners' program and clocked up nearly 1000 km, maxing out at about 60 km on the heaviest weeks, with 30 km the longest training run. He had what turned out to be an unrealistic goal of 3:45. On target until the 30 km mark, he then hit the wall and finished in 3:54, at just under 9 minute per mile pace. He is eligible to run in the NYC Marathon in November 2013.